New Delhi: Government of India, Ministry of Railway has issued order regarding issuance of pensioners’ copy of the PPO to the Pensioner on 29 August, 2017 to all Zonal Railways/PUs. 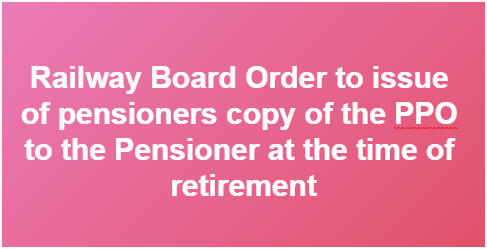 It has been brought to the notice of Board by one of the Pensioners’ Association that the both the pensioners’ copy and disbursers’ copy of the PFC are being sent to the nodal branch of the Public Sector Banks. In this connection, attention is invited to Para 4 of Board’s letter no. F E(HI)/ 2008/ PN1/ 23 dated 17.03.2015 regarding simplification of pension procedure. Para 4 of the letter envisages that the pensioners’ copy may be handed over to him at the time of retirement along with other retirement dues in all cases where the Government servant had submitted pension papers within the time-limits. It is therefore, requested to review and streamline the system prevailing on your Railway. Feedback on action taken may kindly be apprised to Board. Pensioners’ copy may be handed over to him at the time of retirement along with other retirement dues in all cases where the Government servant had submitted pension papers within the time-limits.